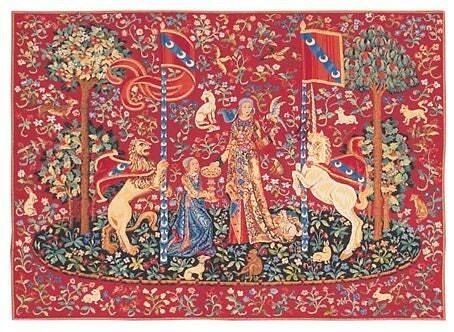 This Museum Collection wall tapestry shows a The Taste, which is part of The Lady and the Unicorn (French: La Dame à la licorne) a series of six tapestries woven in Flanders from wool and silk, The set, on display in the Musée national du Moyen Âge (former Musée de Cluny) in Paris, is often considered one of the greatest works of art of the Middle Ages in Europe. Tapisserie très bien faite, très beau résultat. Contente de mon achat.